The HBO show The Leftovers has a deceptively straightforward science fiction premise: What happens to people left behind after a Rapture-like event? The Rapture is an apocalyptic event prophesied in the New Testament where people chosen by God disappear into Heaven. In the show, roughly two percent of the world’s population--about 140 million people--mysteriously disappear in an instant. Unlike the popular Christian book and film series Left Behind, The Leftovers is agnostic to the cause of the sudden departure. Some characters believe it was the Christian Rapture, but other characters disagree. The show never offers an explanation. By using the second-person narrative style, the show revels in the ambiguity of the departure. This ambiguity reflects the way the characters process the event itself. Was it a scientific or a spiritual event? Why did their loved ones leave? Why did the remaining stay? What does it mean? Where did they go? Whereas pulpy fiction would dwell on that last question--where did they go--The Leftovers is brave enough to tackle the bigger issue: What does it mean? The series is about people trying to find meaning in their confusion, grief, and loss. It occasionally leaps into sci-fi tropes, but it never forgets its mission to examine a world filled with seemingly random and meaningless loss. Since the show is rooted in its desire to find meaning in the context of loss, the viewer is forced to grapple with the power of loss. 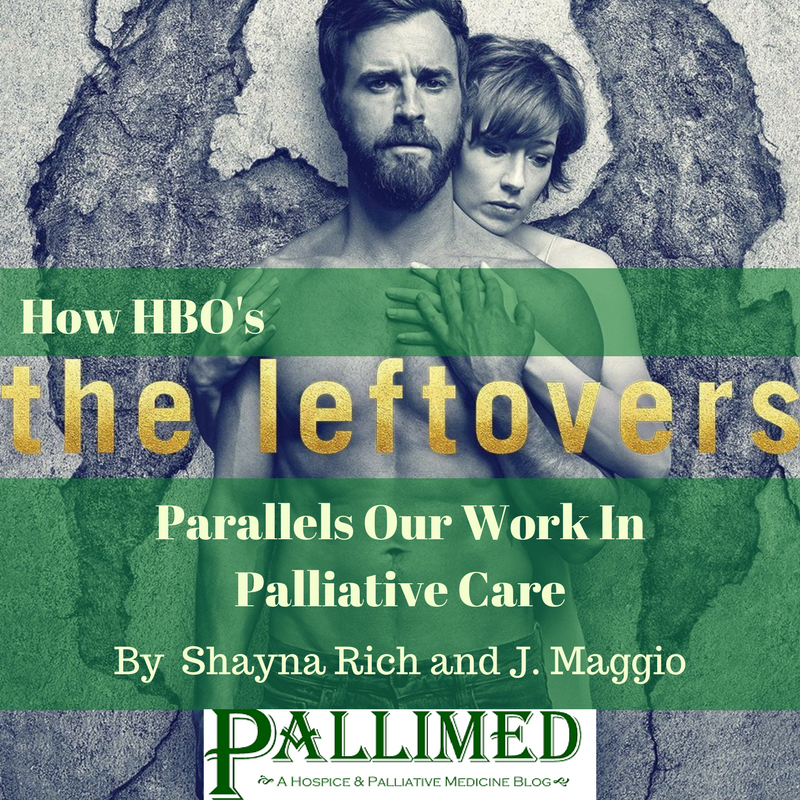 Given this theme, The Leftovers often struggles with the same question that we do in palliative care-- how do we help people cope with grief? Every episode of The Leftovers focuses on one character and it shows how that person copes with loss, either past or anticipated, and struggles to find meaning. Characters ask “Why did this happen to me?” And much as it is for a dying patient, the answers vary. One character, the long-suffering Reverend Matt Jameson, compares himself to Job, a Biblical character who is continuously tested in his belief in God with numerous trials. Matt and other characters insist that God must have purpose in their suffering. Some lose faith or blame themselves. Some even join a cult. But all prefer the certainty of an explanation over the abyss of the unknown. For example, Matt Jameson talks to a man claiming--with some credibility--to be God. Matt wants answers! Yet he struggles to find meaning, even in his conversation with “God.” Likewise, in our work as palliative clinicians, we see the search for meaning every day. Patients seeking a reason for why they were diagnosed with a serious or terminal illness may struggle with their spirituality and their belief in God. Patients often blame themselves if they cannot find a definitive cause of their illness. They may ask us if this happened because of their diet, their smoking habits, or their genes. Patients want a reason, a story to determine a meaning for their suffering. Regardless of the story, any reason is always more satisfying than not knowing why you or a loved one is dying. Like the narratives patients often impose upon their illness, The Leftovers is about the stories people tell to make sense of loss. For most people, it is unsatisfying to view the world as a set of unconnected, random events, and evidence shows that people process the world with narrative. The show focuses on how people choose which story to tell, how they treat others’ stories, and our willingness to impose a story on our lives even if it conflicts with logic, experience, or life events. Nora, a character whose husband and two children all disappeared, struggles with the feeling that she does not want to invent a story for what happened unless it is scientifically accurate. The finale of The Leftovers ends with Nora stating “I knew that if I told you what happened that you would never believe me,” followed by another character responding “I believe you.” Her willingness to accept that others can believe her story without proof, represents her growth over the course of the show. Similarly, in palliative care, much of what we do is provide a sounding board for stories. We listen to patients and family members tell stories of how they were told about their diagnosis, what treatment has been like, and what they have been going through in hospitalization. We encourage our patients and families to do life review and make meaning from their lives by telling stories. And much of the support we provide takes the form of listening and believing their stories. The Leftovers emphasizes the value of that support, especially when the truth is unclear or ambiguous. Cultural critics examining The Leftovers grapple with this ambiguity of truth in their reviews. The show also gives critics permission to explore their own experiences of loss. Even normally stoic critics like Alan Sepinwall open up about their personal lives and how the show shaped their personal grief. Critic Matt Zoller Seitz’s review of a season 2 episode discussed how The Leftovers connected to his feelings of loss as a widower. Seitz's article even inspired the show’s co-creator Damon Lindelof to write a subsequent episode dealing with grief, loss, and belief in God. Most beautifully, critic Mo Ryan's article "'The Leftovers,’ Life, Death, Einstein and Time Travel" connects The Leftovers with her complex feelings toward her dying parents, especially her mother’s death from Huntington’s Disease. It has been shared through social media, causing many tears. 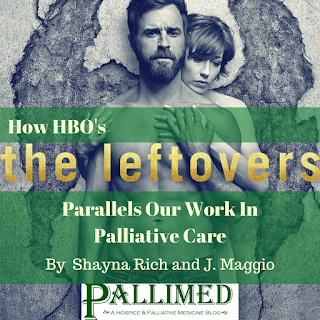 The Leftovers not only echoes the concerns of our patients and their caregivers, it also actively helps viewers process their own losses. It is a profound discussion of loss and pure grief. As with much of our work in palliative care, though, it is leavened with humor. The Leftovers is the type of show where Matt Jameson, dying of cancer, argues about suffering with a character calling himself “God,” but it is also a show where he watches "God" be eaten by a lion. Like most art works asking "big" questions, The Leftovers revels in both the wonders and terrors of the mysteries of life. Shayna Rich, MD, PhD is a doctor who just completed her palliative medicine fellowship and is starting work at Haven Hospice in Lake City, FL. J. Maggio, JD, PhD is her husband, political science professor, and a passionate aficionado of the philosophy of pop culture.